Ahrens has its own steel manufacturing facilities in SA and QLD, as well as an in-house design and engineering team and site erection crews in many states. 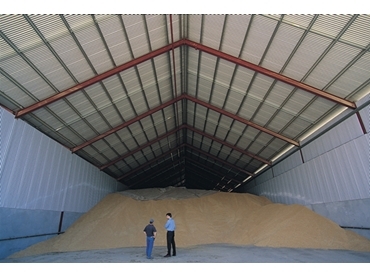 The company is well equipped to deliver grain sheds and other types of industrial buildings to clients. They offer a vertically integrated delivery approach. Machinery Sheds - Ahrens can custom design and manufacture steel framed sheds to cater for all types of machinery. Hay Sheds - available in a range of sizes with the bay spacings designed to cater for bales of all shapes and sizes. Industrial Sheds - Ahrens designs and constructs sheds and warehouses for industrial clients throughout Australia.